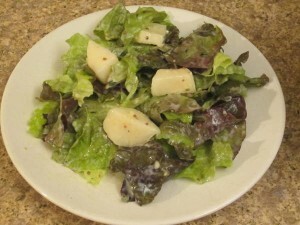 The other day I was eating one of my favorite salads ever, and I realized that I’ve never shared the recipe with you. We call it Jane’s Goat Cheese and Pear Salad, because years and years ago my sister arrived an hour after we expected her for dinner at our squalid New York City apartment bearing a bag of groceries. After rummaging through our kitchen stock for other staples, she invented this salad. Cute W and I, with not nearly as much culinary confidence as Jane, took copious notes on what was, for her, a devil-may-care recipe, and we’ve been making it ever since. Of course, it’s all a bit variable, but oh, it’s so tasty. If you think of it ahead of time, let the goat cheese sit at room temperature for a bit before making salad, so it’s extra soft. Mix the dressing up and keep tasting until you think it’s yummy. You can either stir the goat cheese into the dressing to make it all creamy, or spoon glops of it onto the lettuce at the end. I’m not a huge goat cheese fan, so I always let it soften and mix it into the dressing, and we end up with a creamy dressing that I find delicious, and also more palatable than a big mouthful of straight goat cheese. I imagine that if you’re a huge goat cheese fan you might want more cheese and extra bits of it. If you’re making ahead, you can prepare the dressing and put the pears in and mix to coat (since there’s lemon juice, they won’t brown), then add the lettuce just before serving. That way, everything stays nice and fresh. Yum.